Etsy is testing one-day shipping for the holidays with the launch of its Etsy ASAP pilot program. The program partners with on-demand logistics company Postmates, and enables same and next-day delivery from participating sellers in New York City. To leverage this service, however, consumers will have to pay a flat fee of $20. It is important to note that last-minute shoppers can filter their searches to display items that are available for Etsy ASAP. Plus, Etsy ASAP will appear on individual listing pages and within the cart at checkout. Once Etsy ASAP has been selected at checkout, consumers can choose from three hour delivery windows that are based on the seller’s availability. Orders placed after 7pm will be eligible for next-day delivery. Etsy ASAP is powered by the Postmates API and gives sellers control and flexibility, enabling them to set their pick-up availability and change it at any time. Once an order has been received, sellers can request a pick-up from the Etsy Orders page and Postmates will find a nearby courier to fulfill the delivery. 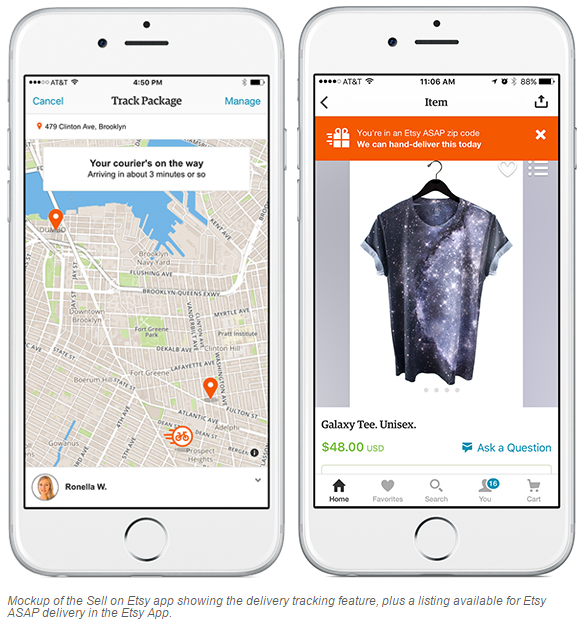 Sellers also have the ability to see the progress of the assigned courier, and once the package is picked up both the shopper and seller can track the delivery in real time from the Etsy app or desktop site. It is important to note that Etsy ASAP is currently available in Manhattan, parts of Brooklyn and Queens. After the program’s pilot run this holiday season, however, Etsy plans to look at feedback and decide on the program’s future.